The article discusses the importance of the factors of the formation of the landscape structure and landscape diversity for the creation of a natural park for the purpose of nature protection and the development of recreational nature management. The results of landscape studies performed in the process of substantiating the creation of a national park of regional significance "Foothills of Altai" in the vicinity of the resort of Belokurikha (Altai Krai) are presented. Functional zoning of the territory of the projected natural park with the allocation of zones of special protection, regulated recreational use and traditional nature management, as well as the buffer (buffer) zone is proposed. Bolotova, N.L., Borisov, M.Ya., Dumnich, N.V. et al. (2007). Variety of landscapes of the national park "Russian North". Vologda. GOU VPO "Vologda State Pedagogical University" (in Russian). Silantyeva, M.M., Baryshnikova, O.N., Dyakova, G.S., Ostanin, O.V., Rotanova, I.N., Kharlamova, N.F. (2017). Natural Park "Foothills of Altai" - a basic element of the ecological framework of the Altai Krai. The role of the Altai Territory in the ecological framework of the Russian Federation: a collection of abstracts of the scientific and practical conference. Barnaul: Printing house of the Administration of the Altai Krai Government, 51-53 (in Russian). Vinokurov Yu.I. (1980). Landscape indicators of engineering and hydrogeological conditions of the predaltaian plains. Novosibirsk, Science. Academy of Sciences. Siberian Brench (in Russian). Natural-meliorative assessment of lands in the Altai Krai / Yu.I. Vinokurov, Yu.M. Tsimbaly et al., Irkutsk, 1988 (in Russian). Atlas of the Altai Territory (1978). Moscow- Barnaul, GUGK under the USSR Council of Ministers, 1. (in Russian). Kharlamova, N.F. (2013). Climate of the Altai region: textbook. Barnaul: Publishing house Altai University (in Russian). Elesova, N.V., Ovcharova, N.V., Silanteva, M.M. (2016). General characteristics of vegetation of the projected natural park "Belokurikhinsky". Acta Biologica Sibirica, 2 (4), 52-58 (in Russian). Rotanova, I.N., Vasilyeva, O.A. (2015). Mapping of phytodiversity in the design of the Belokurikha nature park. Geography and Nature Management of Siberia: a collection of articles. G.Ya. Baryshnikov (Ed. ), Barnaul, Publishing house Altai University, 19, 171-177 (in Russian). The Red Book of the Russian Federation (Plants and mushrooms) (2008). Ministry of Natural Resources and Ecology of the Russian Federation; The Federal Service for Supervision in the Sphere of Nature Management; RAS; Russian Botanical Society; Moscow State University. M.V. Lomonosov; Ch. Editorial Board: Yu. P. Trutnev et al. ; Comp. R.V. Kamelin et al., Moscow, The Partnership of Scientific Publications KMC (in Russian). Red Book of the Altai Krai (2006). Rare and endangered plant species. Barnaul, Open Society "IPP "Altai " (in Russian). Red Book of the Altai Krai (2016). 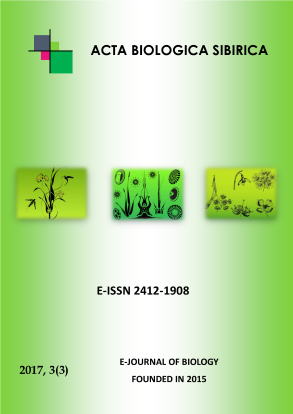 Rare and endangered species of plants and fungi, 1, Barnaul, Publishing house Altai University, (in Russian). Red Data Book of the Altai Krai. (2006). Rare and endangered species of animals, 2, Barnaul, Open Society "Altay " (in Russian). Red Book of the Altai Krai. (2016). Rare and Endangered Species of Animals, 2, Barnaul, Publishing house Altai University (in Russian). Red Data Book of the Russian Federation (Animals) (2001). RAS; Ch. Rare: V.I. Danilov-Danilyan et al., Moscow, AST: Astrel (in Russian). of the Sixteenth International Scientific and Practical Conference, dedicated to the memory of the Honorary Chairman of the RGO LLP, prof. P.A. Okisheva, 1-2 November 2016 Tomsk, 243-245 (in Russian). Kharlamova, N.F., Silantyeva, M.M., Baryshnikova, O.N., Rotanova, I.N., Elesova, N.V., Petrov, V.Yu. (2016). Ecological cognitive tourism in the protected areas of the Altai Krai (on the example of the projected natural park "Foothills of the Altai"). Proceedings of the ARB RGS, 3 (42), 5-12 (in Russian).